On their way to an exotic lagoon two couples get lost in the cornfields. In the vast farmland full of cornstalks the scarecrows keep the birds away because these scarecrows are alive. The four friends have trespassed into the lair of a killer. “It was supposed to be the summer of their dreams.” It became a thing of nightmares. Devon (Maaor Ziv) and Ash (Hannah Gordon) are the best of friends. Devon’s boyfriend Farbsie (Mike Taylor) is an annoying douche who makes bad decisions that get people killed. Unknown to her Ash’s boyfriend Ely (Umed Amin) has a promise ring he’s just waiting to give her. Unknown to him Ash has been thinking of splitting up with him. The Father (Jason J. Thomas) is going to kill each one of the trespassers after he hangs them in his cornfields to keep the crows away. The Son (Derek Christoff) is their only saving grace. The writing and directing duo of Stu Stone and Adam Rodness who were behind 2016’s The House on Kirby Road return for their second feature. Cinematography is excellent, looking like a bigger budget than the film probably had. Effects are kept practical and they’re effective. I also really enjoy the offbeat soundtrack, especially the final song, Scarecrow by Johnnie Newman. The actors in the film seem to be good enough for a horror movie but the characters they’re portraying are so annoyingly cliché you’ll want them to die. There’s not a redeemable character in the entire film. Anyone who finds a human thumb and hides it in an attempt to get laid I’ll gladly enjoy watching you die. 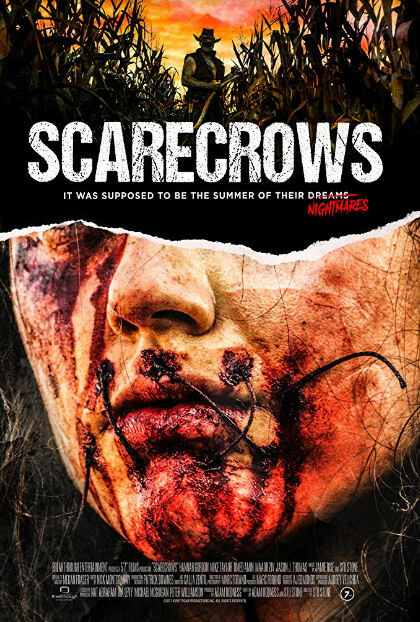 Unfortunately some skilled filmmaking and good scenes of horror are lost on characters who much like the Scarecrow of the Wizard of Oz you'll be wishing, if they only had a brain.